The city of Quebec, which is inhabited by 800,000 people, is the national capital of the province of Quebec. 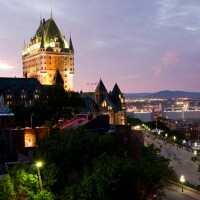 The city is known by the harmony created between the modern city and the old city "old Quebec" considered as world heritage by UNESCO. Québec is especially famous for its lively artistic and musical activity; many shows and concerts are organized throughout the year. It has numerous concert halls, such as the Palais de Moncalm, Salle Albert-Rousseau and Salle Wilfrid-Pelletier. The National Capital is organizing several artistic events, such as the Festival d'Eté de Québec and the Carnaval de Québec. Vibrate to the rhythm of the music that fascinates you and attend the shows organized in Quebec thanks to billets.com.